First climbing center in Valchiavenna. Plaque paths on well-protected granite, stops on chains with rings. 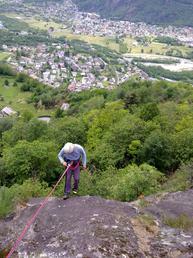 Beautiful panorama (for those who climb) on the valchiavenna and, in particular, on the lace of Prata. SO exposure. Optimal: In winter from late morning, early afternoon, In summer in the morning until noon. in the middle seasons always. Approximately 40 routes from 4c to 7a. Degrees prevalent between 5c and 6c. Access: From 36 exit at Prata and go up to the village, through which you keep left. After three bends you get under the streets, a few places but little frequented, the peak is in May / June when the Swiss resumes contact with the rock from these parts. Rock: Prevalent granite slab with a couple of cracks.